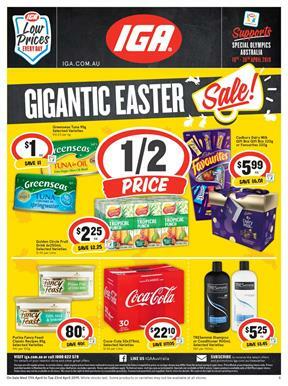 Half-price is a great deal of IGA Catalogue. Easter sale covers a lot of great half prices. 4 of them are Red Tulip Carnival rabbit, Arnott's family assorted biscuits, Sara Lee Ice cream, Nescafe Cappucino that are viewable on pg 1. Browse the deals on fresh produce as well. Kent pumpkin, brushed potatoes, lemons, Australian beef Scotch fillet steak, BBQ beef, and more are available on pg 2. Stock up some bakery and deli products. Tasmanian Heritage Camembert or double brie cheese will cost half. Bread can be expensive but not at IGA. Low prices everyday deal for Wonder White bread, Helga's, Tip Top One bread, 9 Grain bread, and more brands are available on pg 3. Fridge & Freezer range of IGA store is the promotions on pg 4-5. Buy Lean Cuisine Balance meals for only $4! Find pantry foods and sauces like Masterfoods and Campbell's canned foods. Campbell's Real Stock 500mL varieties cost only $1.14! Household supplies like Cold Power, Kleenex, Handee Ultra, Colgate, and more are gonna be in the content. Subscribe to get the newsletter in your email. Alternatively, you can follow our Facebook page to read the news about the catalogues.